Friends and colleagues have long urged Gita to include Forgiveness in the Amazing Grace Series. The knowledge and practical exercises within this book are part of a Relationship Seminar that she has been teaching since 1962. The State of Forgiveness is explored in many ways. This book offers the understanding of behaviour and feeling in relation to past challenges which may have caused bitterness, resentment, regret, guilt, anger, blame, shame, fear, punishment, rejection, sadness, pain and hurt, disappointment, loneliness, grief, despair and a sense of violation. The foreword by Selby Baqwa, Public Protector of the South African Government 1995-2002 speaks of the power of Forgiveness in South Africa’s healing and the contribution Gita has made to this healing within South Africa. For these reasons friends in South Africa asked her to include a major section on Genocide, Massacre, Mass Events and natural disasters in order that the readers of this book can begin to forgive major events in human history. 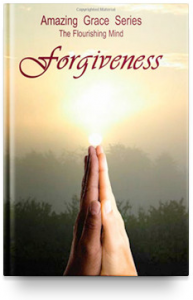 Accompanying this book are Gita’s recordings of all the Forgiveness exercises. These may be downloaded. The Clarion Review rates this book Four Stars (out of Five). Extract from the Clarion Review: The willingness to forgive lies deep within a person’s psyche, and it must be coaxed to the surface through reflection, the awakening of compassion, and finally, the desire for and declaration of forgiveness. The first two books in Gita Bellin’s Amazing Grace Series cover reflection and compassion, subjects that prepare readers for her third book, Forgiveness. This book contains sections of prose instruction intended to help readers “work through,” on their own, the people and situations they want to forgive. The techniques, developed by the author over a period of forty years, can be used to forgive family members, co-workers, governments, organizations, and even natural disasters. Holding onto past distress punishes both the wronged and the wrong-doer. The author plans additional books in this series. Her insights will benefit all readers searching for ways to achieve a sense of the divine through forgiveness.